Get ready, boys, it’s time to bring out the very best part of summer: BBQ grill parties with an electric cooler filled with cold ones. Even if you’re a little late to grabbing a BBQ grill, you’ve still got viable summertime fun left in waiting. We’ve combed through the very best barbeque grill models on the market, bugged a few of our mates about their preferred indoor grill models, and take a look at the entire spectrum: electric, charcoal and gas. Whichever one you choose is up to you; we can’t tell you how to start your own party, we can simply implore knowledge to help you rock the rest of the summer. We’ve fleshed-out an absolutely insane in-depth guide on everything you need to know regarding your next barbeque grill. We did the homework, but you can be the champion of the backyard, the tailgate master, and the camping wizard that brought fun and flavor to the outdoors. There’s nothing like gas grilling and no other brand like Weber. The kings of the grill hit the nail on the head with this gas BBQ grill, bringing a blend of quality and power that works to impress. They’re so confident that this is your next grill model, that they include a ten-year warranty straight from Weber and free expert assembly. Yes, free assembly, nothing extra. Certain components of this are unmistakably excellent, such as the quick start ignition switch, the sturdy wheels that roll over multiple terrain areas, and the burner system. Spirit II E-310 Gas Grill comes in four colors, but we’re going to recommend you go basic black. If you order one of the other colors, it gets scratched up and looks damaged right out of the box, and nobody wants that. You’ll also run into the issue with it being a little top heavy, so getting stable ground for setup is really important. Cleaning this thing is a dream come true, thanks to the porcelain-enameled cast iron grates, and the polished finish of the outside. From top to bottom, cleaning the gas hole, wheels, all of it, it’s just an enjoyable experience. This is a perfect gift for men who love to BBQ. 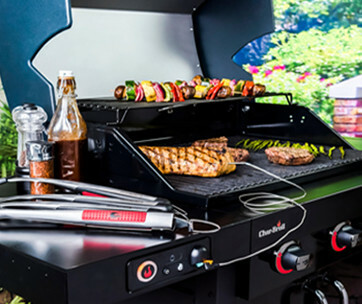 Another one of the giants in the grilling world, Char-Broil brings serious power and ignition to your fingertips. Fitted with a Piezo ignition system, you’ll have a simple one-two click, and it’s off to the races. Dual steel inline burners keep the heat evenly dispersed among the entire unit, so you can focus on grilling instead of keeping the fires going. Much like our top pick, there’s a lot of weight on top, so you’ll want to find some sturdy ground to get everything nice and stable. If that stable ground is asphalt, you’ll have to be careful. The groove on the wheels helps you trek across dirt, but they wear down easily when in contact with cement and asphalt. Two metal side shelves give you plenty of space to utilize your 280 square inch cooktop surface, so you can man the grill, and not have to worry about making ten trips indoors. Lastly, you get a gas connector with Classic 280, so you won’t be running to Home Depot to grab one after it arrives. The little brother model of our top pick, Weber’s take on the more budget-friendly version of their successor grill gives you what you need, with a little less added features. You get slightly smaller side trays, but the same great high-quality wheels. Spirit II E-210 isn’t as topheavy as the other Weber we reviewed, so you can park it with a bit more confidence that it’ll stay standing strong, all cookout long. Getting it there is a hassle though since there’s no real designated spot to hold onto while moving it, apart from the side tables. The temperature gauge along the hood is fairly inaccurate. While testing it with a high-quality standalone thermometer, we found a 50-degree difference in each reading. Even so, it still gets plenty hot enough, you’ll just have to rely on your judgment over the gauge. 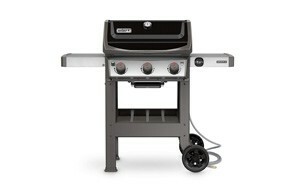 You have an impressive 529 square inches of cooking space to grill everything up, and a GS4 infinity ignition system. Click, flames fly, and you’re ready to become the champion of Labor Day weekend. 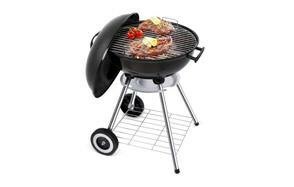 Be sure to also check out our list of the best indoor grills for more great items like this. The ultimate grill to bring camping with you, Smoke Hollow’s got a grip on the small propane grill game. Being portable, it runs into a few more problems than you’d be used to with your larger backyard grill. You’ll notice that the burner system along the interior basin is sturdy, but the braces holding it in place are not. You’d do well to keep an eye on this after each transit, say to the park or camping site, to ensure it stays in place. You get an impressive 10,000 BTUs of power in this small space, giving you quick cooking and major power. Foldable stainless steel legs make transit a dream, while the high-grade stainless steel construction makes this resistant against anything. With these smaller, portable modells, you run into one major problem: the handle heats up immensely, and you scorch your hand trying to get it open. Smoke Hollow took that into consideration, ensuring that their double-ply handle keeps the heat where you want it: inside the grill. Great ignition system, powerful grill, a whole lot of memories ahead. Weber’s all over this list, there’s no doubt about that, and it’s for reasons like their ten-year warranty that they just can’t be ignored. Weber Genesis II E-310 Model Gas Grill hits the higher end of our price range for this list, but you get an impressive cooking surface area. 513 square inches spread across three stainless steel burners, while the additional warming tray adds 156 square inches of space to help manage the influx of food you have to cook. When it comes down to the wheels, that’s where the quality starts to drop. The smaller wheels have a locking system, but it’s fairly fragile, considering the weight of the grill and everything you’ll be putting onto it. We’d recommend paying attention to it. While ours didn’t fail, that was a short test experience, and long-term use could be a different story. All in all, there aren’t a lot of issues with this grill, other than the price point. You get what you pay for, and in this case, it’s borderline excellence. Our handy guide to the best camping grills features more great products like this. Char-Broil is one of America’s favorite brands, and it’s for reasons like this shining testament to their engineering prowess. 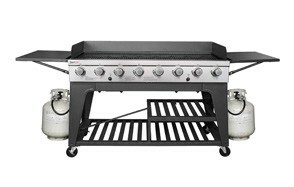 With 4-Burner Cart GRill you get an impressive 36,000 BTU power system, complete with four burners. Use as many or few as you like depending on the occasion, and cut down on propane consumption. With all that power comes great heat, which is going to reflect in the knobs when you go to adjust the flames. They heat up quickly, and while it doesn’t inhibit their ability to function, it’s a little surprise when you go to turn the dial. The high-functioning electronic ignition system is excellent and never fails. In our experience, the first click always sparked a flame. The overall build of the grill was fantastically crafted of durable stainless steel, with a lid that contains all of the heat exceptionally well. Char-Broil doesn’t mess around when it comes to power and gives you plenty of space to utilize every last bit of it. Conserve propane, grill like a master over 550 F, and stick with the last grill you’ll ever need to buy. We all already know that Weber is the ultimate king of the grill, but there’s even more to love in their other models. Genesis II LX comes with a few added features, such as a small LED handle light that illuminates your space when you open the lid, and automatically shuts off when you’re all done. Between the range and the burners, you get a total of 669 square inches of space, giving you total mastery over the grill (and far less time standing at it). Ignite your infinity ignition system, and fire away. There’s a similar problem across this brand and series of grills, and that comes in the low-quality wheel locks. You get four wheels in total on this, and while it’s easy to maneuver from spot to spot, it doesn’t always want to stay in place. On top of that, they skimped out on one major detail: the grates have no porcelain coating, meaning food will stick to the unfinished stainless steel. One of the reasons that Weber will always reign supreme is their ten-year warranty on just about every grill they’ve ever made. That’s confidence that when challenged, you just can’t lose. Make sure you also buy good meat cleavers because you will want to use this grill every day. Wood pellet smokers are notorious for being the new cutting-edge way to get a great grill going, but are sorely misrepresented. Wood pellets tend to cost more than coal, but less than propane, and bring a crazy amazing flavor. Z Grills made this stainless steel, brass-colored masterpiece extremely durable. While the coating is a bit dodgy, this is a well-constructed piece you’ll have forever, so long as you can move it into a proper spot. This monstrous machine weighs 172 lbs, meaning you’ll need a dolly or a friend to help you out when it comes time to move it around. There’s an LED temperature readout, giving you accurate results so you can properly plan out the rest of your cooking. Z Grills wood pellet smoker goes between 180 F and 475 F, plenty of range to keep things hot enough throughout the entire day. Last but not least, we have to give credit: there’s 700 square inches of cooking space on this beast. If you run out of space, it means you must be feeding an army. Royal Gourmet Event 8-Burner Grill is borderline premier kitchen quality, though it doesn’t always arrive that way; damages, dents, and scrapes have been reported, though our model arrived just fine. This heavy and wide unit boasts an impressive 950 square inches of cooking space and boasts well over 100,000 BTUs of total power between all stainless steel tube burners. That’s some serious power, but it’s going to cost you. You’re going to need two propane tanks to feed this thing, which can rake up the costs to get your full use out of it. The selection we’ve chosen comes with a waterproof cover because this isn’t something you’ll just carry in and out of the house willy-nilly. It’s heavy, awkward to move, but cooks up some mean burgers and chops. A simple one-click ignition system can set all eight burners alight at once. Lastly, there’s a couple of fold-out stainless steel side tables, each able to hold 25 lbs for heavy glass bowls, plates, and rows upon rows of spices. If you want to surprise your loved ones with a useful Christmas gift, this grill might be the answer. As we descend into the bottom of the list, there are a few models that come with a couple of extra picadillos. Backyard Grill made an excellent cost-effective model, though there’s a great option to either use gas, or pull out a bag of charcoal when that doesn’t pan out. If you switch to charcoal, you won’t be able to use the excellent side burner, as a heads-up. When you get to the temp gauges, they’re basically useless and fluctuate far too much. With a gas grill, you’re supposed to have steady control over your heat. This 3-Burner Charcoal Gas Grill Combo does conserve gas fairly well, so you won’t be running back to the refill station halfway through the cookout. Altogether, you get what you pay for, and this is reliable enough to be your outdoor companion for at least five years. Weber Original Kettle Charcoal Grill is what comes to mind when someone says charcoal grill. A round kettle grill with a few wheels that you can bring right onto the campsite. You can’t beat old charcoal, especially for this rock bottom price that allows you to get started in a matter of minutes right out of the box. You get an ash catcher along the bottom to aid in cleaning out the basin, though it’s not going to retain that aluminum shine for very long. After the third cleaning, it starts to maintain ashen color. The basin does a fantastic job of keeping the heat in though, allowing you to control your grill’s temperature properly. That’s also due to the stainless steel ventilation valve along the sturdy lid, which hooks on to keep everything nice and toasty. If you’re worried about the handles, you don’t need to be: even though the grill gets hot as can be, the handles are coated to resist most of that heat, so you don’t scorch your palm when you go to pull the lid off. 363 square inches of cooking space, all for a low cost with perfect weight distribution through the stand and wheels. Who’s hungry? This also makes a great housewarming gift for your loved ones. Yes, you can still get that lean, mean George Foreman fat-burning machine outdoors. This bar table-style electric grill is perfect to feed a good-sized party, giving you 240 square inches of cooking space. If the weather isn’t permitting it, you can pop the stand off, set it on the countertop and still get full use out of it. Energy-efficient, apartment friendly, and built to last. This has been the same excellent model that’s been selling since 2000, and for good reason. When it comes to the non-stick coating, you have to be careful with it. No metal utensils, and while plastic spatulas don’t paint the perfect picture of grilling, it’s better than scraping up the coating. You’ll also notice that the drip tray fits a bit loosely, but other than that it’s a great, low-cost grill that can get you going without any additional fuel sources needed. As a last note, the cord is fairly short, so you’ll want an extension cable even if you’re just out on the deck. Pull up a chair. No, really, pull up a chair, because Beau Jaron Portable is one short grill. Resting at just two feet tall, it’s a bit more difficult to use than the other models we’ve suggested but comes in at one of the lowest prices we’ve ever seen for a charcoal grill. This can get you going right out of the box, and comes with an ash catcher for quick cleanup. If inexpensive grills have failed you before, that’s because they didn’t have the enamel coating on the basin interior as Beau Jaron has. Pull this anywhere and plant it in place, just note that the plastic caps on the bottom of the stationary poles are going to slip and slide a bit on asphalt or wood. Not the most reliable, just pick a flat surface. If you’re not satisfied, they’ll give you a full refund within the first three months, or replace it for free, whichever you’d prefer. This grill looks so cool, that it can even be a perfect gift for a manly man in your life. We’re going vertical with this one. Fuego is basically a pillar of fire, thanks to the porcelain-coated, cast iron grate and insane heating element system. Though it only projects 21,000 BTUs of power, you get a crazy high temp of 650 F. It only takes five minutes to ascend to 500 F, which saves you time on preheating and overall fuel usage. With all that power comes great responsibility, and a really hot lid. Even if you think you won’t need a mit to open the lid, take our word on it. As with a lot of models on our list, the thermostat on this is basically useless. It’s a good quality piece, but it’s essentially right over the burner, so you’re getting some embellished results, not what’s actually going on inside the chamber that’s cooking your food. Don’t worry, on an independent test, we can vouch for the 650 F total temp range from other thermometers. A great ignition system, 346 square feet of cooking space, and a fantastic price. Last but not least, Weber didn’t fail us with a super inexpensive model. Their portable Smokey Joe grill is a small charcoal grill, complete with an ash catcher, reinforced handle along the top (to prevent it getting crazy hot), and a tripod design so it stays where you set it down. They’re Weber, so they still slap that ten-year warranty on even their most inexpensive model. With the price comes a much smaller cooking surface than any we’ve reviewed on this list, but it gets the job done. Just be wary of the steel vent slider along the top so it doesn’t scrape the exterior. You’ll have a quick time cleaning the porcelain-enameled cast iron grate along the interior, and an even easier time packing this up to head on home after a blissful weekend in the woods. Everything you wanted to know about conquering the summer, barbeque grill style. Everyone loves the gent who’s manning the grill, but it definitely puts the pressure on you. From cleaning to selecting the right barbeque grill, we’ve laid it all out for you below. Performance - This all comes down to how well it retains heat, how even the temperature distribution is, and the quality/size of the grates and how that brings results. You’re going to have different criteria for the main three grill types, but generally speaking, you want something that insulates well and maintains a high temp. Brand - This is a very competitive space, which gives you, the consumer, a lot more to benefit from. Certain brands do nothing but eat up other brands, trying to be the king of the grills. Brand matters immensely here, and you can usually cash in on the underdogs who provide way better customer service. Don’t worry; we’ve outlined those in the product selections above. Quality - There are so many measures of quality, but they mostly come down to the main material used for the shell/legs, how well the wheels move, the quality of included features like a meat thermometer, temperature gauge, burner, etcetera. At the end of the day, you want something that’s going to last for years to come. Price - You’re dealing with some higher costs here, but that’s just how it goes. Price is going to be a determining factor on this one, especially with so much competition in the outdoor cooking space. Hunting down the best deals can be tricky, which is why we outline the best value and premium selections in each buying guide we write. Type - You’re dealing with three main types: charcoal, gas and electric. It all comes down to your preference, but keep in mind that these operate differently, cook food differently, and even need to be cleaned and maintained in totally unique fashions. The type of grill that you’re comfortable with is like the prerequisite to selecting the right fit for you. Dimensions - Storing these is never fun, so make sure it’s perfect to fit in your trunk, flatbed, shed, or wherever you end up storing it. Dimensions will also dictate capacity and cooking capabilities. Capacity - Just because you have certain cooking capabilities and square inch spacing, doesn’t mean you can just jam everything together on the grate and call it a day. Your capacity doesn’t necessarily determine how much you’ll be able to cook at the same time. Portability - Anyone up for some tailgating? Whether you’re headed to the stadium, or you’re just going to the park with your friends and kids, having a portable grill is essential. Look for all-terrain wheels, ease of use, and the total assembled weight. Weight - This directly affects portability, and if it’s a bit too heavy for you, it’s going to make it a hassle to pull in and out of storage as time goes on. Cooking Capabilities - Square inches on the cooking space, how many burners it has (gas grills), and anything that has to do with the actual cooking process. You can get a shiny, sweet-looking grill, but it all comes down to how it performs. Ease of Use - Charcoal is easy to use, gas and electric are a bit more difficult to use. Each grill is going to come with their own added features, whether it’s additional burners or heating elements. Point is, you want a quick start, and an easy way to wind down after you’ve cooked off the last of the chops. Gas - As it sounds, this uses gas to get the job done. You’ll have to connect a propane tank to a secured gas line (which almost always comes included with the actual grill purchase). After a bit of learning how to do it the first time, the task won’t seem so daunting in the future. Gas can get pretty pricey if you’re making this a weekly thing. These grills usually come with one-click ignition systems, so you can get a spark going, and begin cooking almost immediately. Keep in mind that this system is very simple for little ones to mess with, so turn the valves off when you’re done to prevent little fingers from stating it back up. Charcoal - The most classic way to go. Bags of charcoal can get a little expensive, but if you bulk up all at once and keep it in a dry, watertight container, you’ll be good to go for the summer. Charcoal takes a little while to get going, especially if you don’t like to use ignition fluid to get the party started. Charcoal grills provide a bit of a smoky flavor to your meats and vegetables, which isn’t for everybody. The main thing to keep in mind is that you have to let the coals burn out at the end, so don’t plan on killing the flame and packing it up right away. Adding water to cancel out the embers will result in a sticky, thick black goop that cakes to the basin. Electric - Electric grills are obviously more of a modern convenience, and while you’ll be plugging these into an extension cord, you’ll be able to cut down on gas and charcoal costs. These things aren’t any good for visiting the park or tailgating but are definitely a lot quicker and a lot safer than the two other methods. Though they can be a pain to use when you need to find a power source, these are often very portable, and due to the infrared technology within, you’ll be able to grill up food extremely quickly. Electric grills also have some of the most simplistic cleanups. Q: How do I Prepare the Grill? A: 1. Make sure your grill is clean. Even if it’s fresh right out of the packaging, run it down with a rag to remove any metal-preserving chemical powders that may rest on the surface or the interior. Start with a clean grill, one that you can be certain of. Optional: Oil your grill grates after cleaning. This is often skipped, but keeps food from sticking quite as bad, and provides a nice searing hot iron to place those steaks down. Use olive oil when possible. Pick a good spot. You want the least amount of wind hitting the grill (to prevent flare-ups), while also having somewhere strategic. If you have a large family gathering, have it close enough to them to make food transportation simple, but far enough away from the house to prevent heat and smoke buildup. Start it up. Whether it’s gas, propane or charcoal, fire up the grill and get it going. If you have sid burners on your gas range, keep something over those (if you don’t intend to use them). When you set the grill up, be certain it won’t be left unattended, or within reach of children without another adult present, if you have to step away for a moment. Q: Is Grilling With Charcoal Bad for my Health? A: Yes and no. As we all know, California’s Proposition 65 makes everything a bit scarier when it comes to purchase time. While we’re not invalidating their claims and research, charcoal can be a perfectly healthy way to grill your food. As with gas, when fats from meats drip down to the charcoal, it creates something called PAH. This rises and sinks into your food, and is most notable when you get a charred, blackened color on the outside, and taste that bit of flavorless in those areas. So long as you’re not grilling every day, these aren’t anything to be concerned about. Q: Which Fuel is the Best? A: Electric grills have a benefit in terms of flavor and a lack of PAHs, but if you’re talking about actual fuel, propane is by far the best. Natural gas grills will boil fats that cook and drip down to the basin, causing them to rise back up as a harmful chemical. Propane is more controlled, allowing you to get a more consistent heat, with far less of the negative effects. Nine times out of ten, we will personally recommend propane, though that’s not to discredit the flavor and cost-saving benefits of other fuel like pellets or charcoal. Q: How do I Light the Coals? A: You’ll want to either get a book of matches or a long-stemmed lighter and a small bottle of lighter fluid. The trick is not using too much fluid, otherwise, you’ll have immediate flare-ups, and all that fire won’t stick to the coals in a way that it’s supposed to. Use too much, and you’ll actually burn through it way faster than you should be. With that being said, this is the most popular option, but not what we at Gear Hungry recommend you do. Lighter fluid can add a chemical flavor to your first batch of meats. It’s a potent mixture, one that sort of clings to the charcoal if it successfully lights. You can start a good coal fire by leaving the vents partially open, and stuffing three or four rolled-up pieces of newspaper beneath the bottom coals. If you have plain white paper or brown paper bags, even better (no ink). Use those, light them and jut them into the coals to get a good start. It might take longer to see results, but if you’re focused on flavor, it’s worth it. Q: How do I Control Temperatures on my Charcoal BBQ? A: You’ll need to feed oxygen to the coals below while closing the lid to maintain a bit of heat inside the grill. The sweet spot you want to look for is 225 F, where most foods cook at a good temperature to keep it burn-free on the outside, and thoroughly cooked on the inside (depending on what you’re cooking). There are a few hidden methods to control temperatures. Food Guard - If you’re worried about temperatures fluctuating too much, you’d do well to use a tin foil shield as a guard between the food and the fire. When it comes to charcoal grills, they can get a bit unpredictable, unlike gas or propane. This keeps a certain amount of heat penetrating through the aluminum, and a good amount being reflected back to prevent burning your food. Ventilation - If the temp hits a high that you’re not comfortable with, it’s time to open up those vents. While those feed oxygen to the grill, you can increase the temperature by opening them more or decrease the temperature by keeping them nearly shut. Either way, it’s like having a slider on the heat level. Q: How Long do I Let the Charcoal Burn Before I Start Cooking? A: Charcoal acts like a campfire; it takes time to get the larger pieces burning. When you break into a fresh bag of charcoal, they’re generally all the same size, so you need to let them all build on one another’s fire before things really get cooking. You should wait for twenty minutes after using lighter fluid and igniting the charcoal. If the fire is centered and not igniting enough of the charcoal (at least 70% of the basin), then you’ll need to use lighter fluid to spray on the surrounding charcoal. You basically want to see a nice warm glow before you put food on it, or get a temperature up to about 225 F beforehand, whichever is easier for you. Q: Should I Open or Close Vents on my Charcoal Grill? A: The flames in your charcoal grill need oxygen to burn properly. If you’re going to grill with the lid down or the cover on, you need to have those vents open as much as possible. Heat won’t be able to build properly without an outlet for the smoke to get out; it needs a fresh source of air. Your unit should have two sets of vents: base and chimney. The chimney allows smoke to rise, but the side vents are directly near the flames, which allow them to feed off of nearby oxygen. You’ll need to have both of them open to get the results you’re after. Q: How do I Clean and Maintain my Charcoal BBQ? A: Charcoal barbeques are the easiest to clean and maintain by far. You’re usually looking at very light metal with a fine finish on it, but keep in mind that it won’t look that way for too long (on the inside). Start by removing the grate and all old charcoal. If some of it sticks to the interior, that’s okay, we’ll be getting it out in our next step. Be sure to dispose of the old charcoal appropriately. Chip off what you can from the grates, and soak them in a solution of 1/2 cup of vinegar and 1 cup of baking soda. Spread this over the entire grate, and let it sit. Head back to the basin. Use light force to get any additional debris loose, and dispose of it once you have. You’re going to take a steel wire brush to the remaining area, breaking off and loosening anything else that remains. Rinse it out with a hose, and clear the remaining gunk off of the grate. To avoid rust, you need to let both of these air dry without touching, preferably outdoors if the weather permits. While these are drying, tend to the exterior with a cloth, and ensure the wheels are cleared of debris. Q: How do I Store Charcoal? A: You’ll want some form of a watertight container. Charcoal is susceptible to humidity, so you won’t want to store it outside. You want the driest, coolest room in the house to store it, whether that be a container in the kitchen or by the air conditioner in the living room. You can find many inexpensive plastic chests that would be perfect to store charcoal in. The material of the storage container doesn’t matter as much as the tightness of the lid. If you’re looking to make this work on a budget, you can always grab an inexpensive plastic container and seal it with electrical tape between uses. Q: What Type of Gas Should I Use? A: We recommend propane above gas. Propane is more stable, cooking the food instead of burning boiled fats. When you’re standing over the grill (or eating the food that comes off it), those burned fats can cause PAHs, which have been linked to cancer. For most people, you would have to eat barbeque every day for years to have enough doses of it in your system. It’s only been proven in controlled laboratory tests, using mice as an example. Q: Is Grilling With Propane Bad for my Health? A: Everything in moderation. Gas has been proven in independent laboratory studies to contain higher concentrates of HCAs and PAHs, which is why we recommend propane above all else. Propane produces far fewer levels of these harmful results, but even then, there are still ways to combat the persisting negative effects. Marinate your meats and vegetables with a vinegar or lemon glaze. While this might not be the best taste for whatever it is you’re cooking, it will definitely cut down on carcinogens. Propane is the safest option for gas grilling. Q: How do I Control Flare-ups on my Gas BBQ? A: There’s not one surefire, clean-cut way to do this, but there are a handful of tips that seriously cut down on flare-ups. Apply as many of these as possible, but don’t be too hard on yourself. Sometimes the conditions are against us, and we have to work with what we have. Put a Lid on it: No, seriously, keep the lid down as much as you possibly can. If you stick to doing this, you’ll mitigate the flames. They feed on oxygen, and while the gas contains a certain level of oxygen and continues to feed the flames, being exposed to wind and air above the grate will set it into overdrive. Move the Food Around: The dripping grease could be causing flare-ups, especially if pockets have formed along the bottom of your BBQ grill. If you have space, move your food around. It might take a moment, but the flare-ups should cease. Turn Against the Wind: Wind can rustle underneath the grates, shift grease around, and cause flare-ups all on its own. Consider moving the position of the grill (with help, since it’s on) to cut down on the wind, and protect yourself against those flare-ups. Q: How do I Test my BBQ for a Gas Leak? A: First of all, you should be testing your grill every time you go to use it. Gas grill leaks aren’t necessarily dangerous (depending on the severity, you’ll just come outside to an empty tank. There’s a few tips and tricks here to get this taken care of. First of all, always test outdoors. If there is a leak, you don’t want to inhale gas or subject your pets/children to it. Make sure the valve is closed, and mix together a simple soap and water solution. Once you do this, use a brush or cloth and spread it all over the gas line coming from the tank. Once you can see soap bubbles all over the hose, open the valve completely. You’ll want a good angle of the entire gas line. If you see bubbles forming with the valve fully opened, then you’ve got yourself a leak. Q: What Should I do if my Gas Tank is Leaking? A: You don’t have to toss the gas line in the garbage. Get yourself a can of Flex Seal, and give it a spray. You can go with clear, or you can go with black to match the rubber of the line. People use this stuff to patch holes in the roof and trust it enough to waterproof it to prevent rainfall from getting in. A bit pricey, but you’ll definitely find additional uses for it around the home. If it’s a really bad leak or the hose was split, you’ll want to go ahead and grab an entirely new one. This can get tricky depending on your manufacturer, and it will be very tempting to grab a one-size-fits-all gas line. Just because it attaches to the Blue Rhino tank doesn’t mean that it’s going to fit properly in the rest of the unit. Q: How do I Clean and Maintain my BBQ? A: Before you get started, assign about fifteen minutes to this task. We’re going to list how to clean each individual type of grill, being charcoal, gas and electric. Let’s get into it. Cleaning Your Charcoal Grill - Charcoal grills require the least amount of working parts that you need to clean, but can seriously take a long time if you wait too long in between cleaning cycles. Follow the steps below, and you’ll have a fresh-out-the-box clean charcoal grill in no time. Empty the grill of all old charcoal. If it’s still usable (like if you put the fire out and it still had time to burn), store it somewhere safe for the time being. Take an appropriate brush, and begin scraping the interior of the basin. Depending on which charcoal grill you went with and what materials it’s made out of, you’ll have different cleaning requirements. Pay attention to the care and maintenance in the instruction manual, and use a bit of common sense when it comes to abrasive/hard wire brushes on thinly coated materials. Soak your main grate in a solution of baking soda and water. You don’t want to use dishwashing detergent, as it can leave a bit of residue and flavor your next batch of food (if you aren’t careful). Break off all the debris you can, and soak it in a tub or sink depending on the grate size, filled with warm water and enough baking soda to cause a reaction. Check out the stand/wheels on the charcoal grill. Give it a wipe down, and if you have it around, use some WD-40 to make sure everything’s moving nice and smoothly. If you bring this to the park or throw it in the flatbed often, it goes under a bit more stress, so this is the perfect time to grease the wheels and moving parts. Remove the grate from that mixture and set it out to air dry. 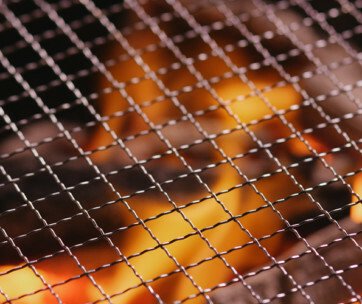 During this time, if you have a cover for the charcoal grill, wipe the soot out from the interior of the lid. Reassemble it, and you’re good to go. Cleaning Your Gas BBQ - This is a bit more in-depth, but due to the extreme temperatures from the gas ignition, you won’t have as much debris caked onto the grate. Here’s what you need to do. Remove the grate, turn off the fuel tank, and undo the hoses. The hoses don’t really need to be cleaned right now, but you’ll want to clean the area that they feed in from. Use a harsh metal brush to scrape the grate over a trash barrel. Empty the soot and debris from the basin of the main cooking chamber, dump it into the garbage, and use that same brush to scrape everything out. This process doesn’t take too long. You don’t even need to soak the grate in a cleaning solution, it should be all good to go. Do a quick wipe down of all moving parts: trays, burners, wheels, everything that could use a bit of elbow grease. If you have side burners, remove the coils and plates, and clean those separately. Secure the hoses to where they belong, and place the grate back where it was. The only other major thing you really need to do is quickly wipe out the soot on the inside of the hood, and the chimney stack. Cleaning Your Electric Grill - I would say these are among the easiest to clean. These steps are fairly simple, just keep in mind that electric grills usually have a thin porcelain coating, so you have to be a lot more gentle with the grates and basin than you would be with a gas or charcoal grill. Remove the grates and place them by the sink. You’re going to use gentle soap and the pressure from your faucet spray hose to clear all the debris off of your grate. It’s very important to air dry these; lean them up against something if possible. Use paper towels or a light cloth and brush all the debris out of the basin. Due to the infrared technology, most of that debris is actually just grease that’s been caked on. This might take a bit of time, but don’t use abrasive steel brushes on the inside of your electric grill. Clean out the grease drip tray. From there, clean the inside of the hood, and wipe down anything else you see: handles, thermostat gauge cover, etc. Replace the grate once dried, and you’re good to go. Electric grills are a lot easier to maintain than others, yet a lot easier to damage. If you scratch up the porcelain coating, grease is going to stick to the underlying materials like glue. Q: How Does Food Taste on a Charcoal Grill vs. Gas Grill vs. Electric Grill? A: Some of this is up to personal taste, so take this with a grain of salt. The most common differences between flavor on your meat and vegetables definitely comes down to how you cook it, so let’s get into it. Charcoal - If you like meats described as having a smoky taste, then this is exactly what you’re looking for. Charcoal can be a pain to get going, but it adds an earthiness to meat and vegetables and keeps a lot of flavors packed in. Cooking on a charcoal grill brings some uneven results (unless you know how to properly set one up), and tends to leave food a bit drier than other methods. 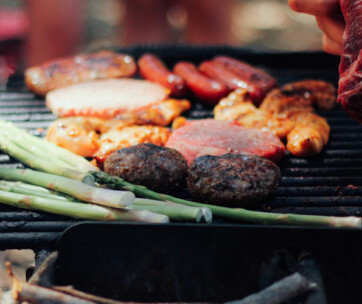 Gas - Gas gives off less of a taste than charcoal, but there are some health-related risks that come with using a gas grill. It undoubtedly gives a residual flavor to meat and vegetables, though it can be avoided with proper tin foil or simply keeping the lid open/time spent on the grill short. Gas is often more sustainable than charcoal and offers a more through cook all the way through the center. Electric - Call us crazy, say we’re not old-fashioned, but these actually keep a lot more juice in your steaks and burgers. Since most of these are using infrared heating technology, it creates a heat barrier on the outside of your food, locking in all those excellent flavors on the interior. Electric grills were first made for commercial use, so if you’re a big fan of visiting steakhouses, you’ll notice some similar flavors.